So what eats insects, but has the most powerful, bone-crushing bite force among mammals? I once petted a hyena; and I put the experience in the same category as the first time I touched a dolphin...it was a shock. Dolphin skin feels like a banana peel... like if you pressed your fingernail into it, a little crescent-shaped slice would appear. 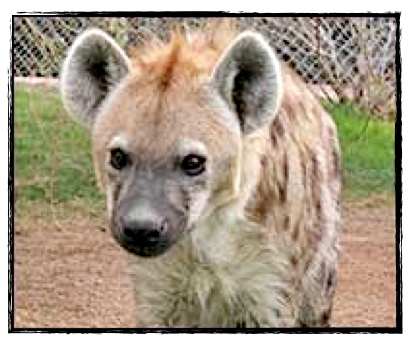 But Buster, the Spotted hyena who wandered around like a mascot at Wildlife Waystation, had fur that was very harsh and coarse; almost like straightened steel wool. And because there was no underfur, I could see the mottled skin showing through a bit. Kind of like... thick bristles on a pig. Buster was an affectionate guy, with a large head and lots of big teeth that he'd show in a sort of unsettling smile when you scratched his belly. And he sometimes had that queer slinking gait that you see in certain German Shepherds. Have you ever heard that hyenas are cowards? Before we go further, let's figure out where this idea comes from. When attacked by a predator, they defend themselves by "playing dead"
So....who are the cowards? Right...let's take a look at these two. 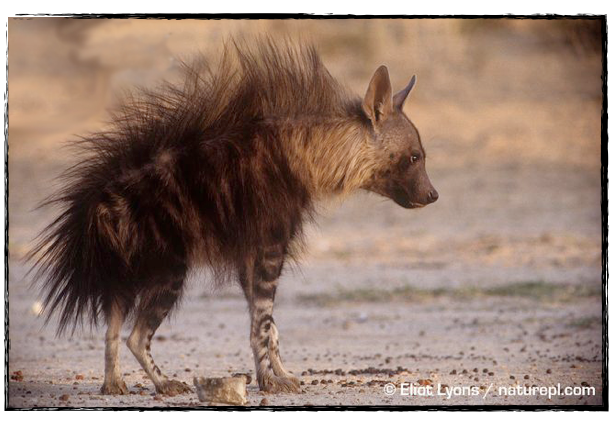 Here is the Striped Hyena...kind of funky-looking when he's all upset, isn't he? 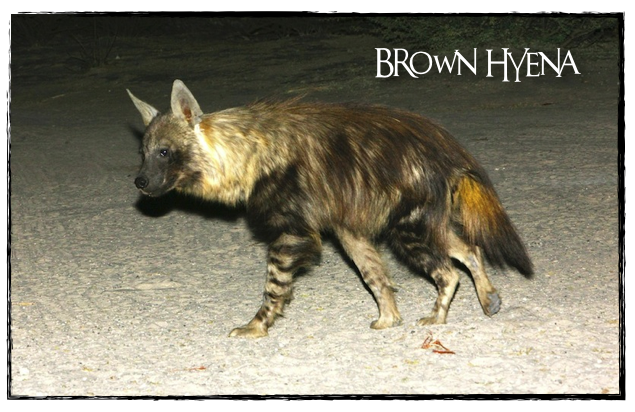 These guys may act "cowardly", but keep in mind that a Brown hyena pup can crack the leg bone of an antelope within hours of being born! Most impressive. Okay, those molars are fearsome-looking...and much larger proportionately than the lion's! And look at the very front teeth...really, they look like like fangs. But what about that whole Insect thing in the title of this post? 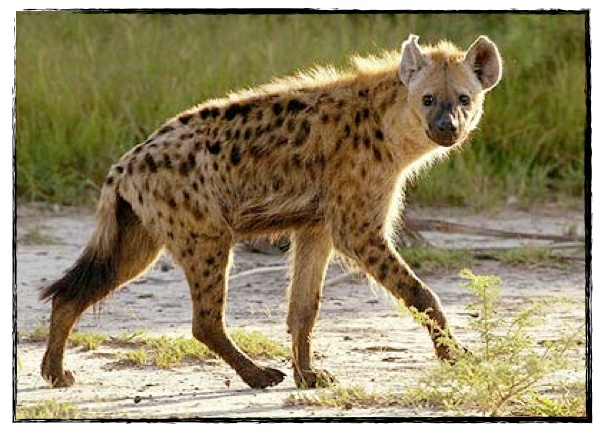 Well, that's where the fourth hyena type comes in...the Dog-like hyena. 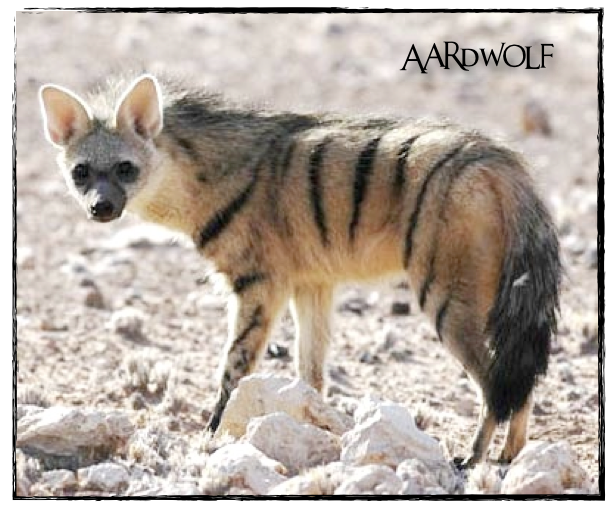 Better known as the Aardwolf (Dutch for earth wolf). Yes he's a hyena, but he lives on insects...he can slurp up 200,000 termites in a single night with his long sticky tongue. 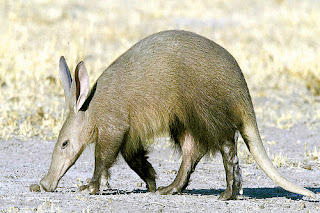 But, don't get the aardwolf mixed up with the aardvark. Though they both eat insects, there's a biiigg difference in classification! So now you're up on hyenas...all four types. 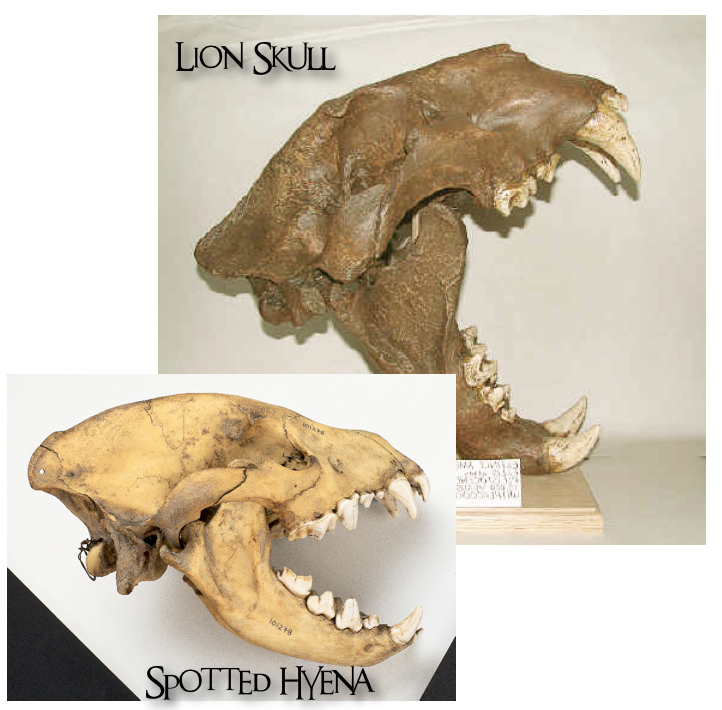 If you want to read more, there's a woman doing a fascinating study on the Spotted hyena that you can check out here. 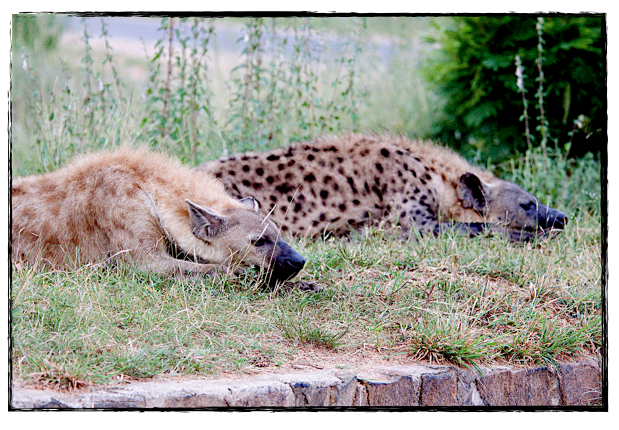 And, don't forget to read my post on the amazing Hyena Men of Africa, here. The Aardwolf doesn't look very fearsome. :D I LOVE HIM! 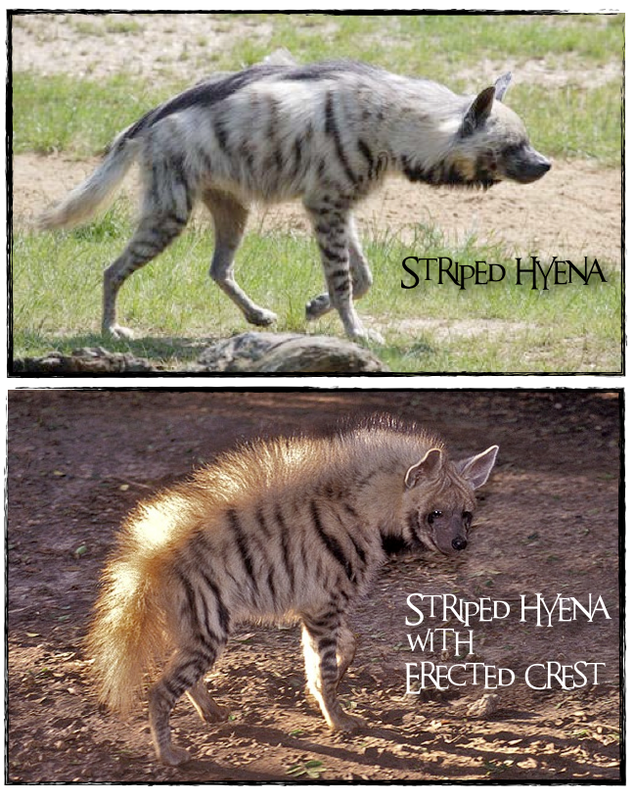 I love the striped hyena with the erected crest. He looks like he has a really big mohawk. Lois, I agree. 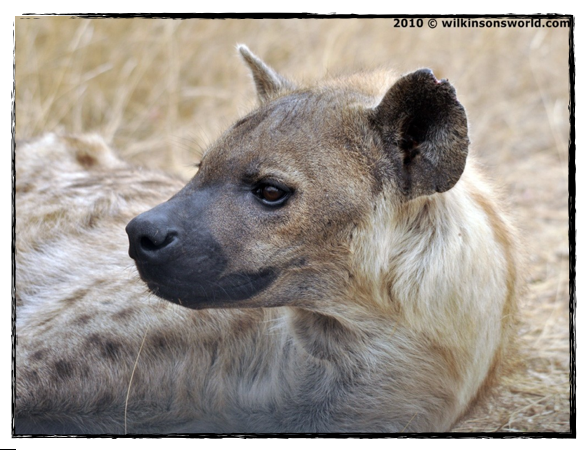 Hyenas are amazing, and there is so much more to tell about them than I had room for in my post!